The assassination attempt of Gabrielle Giffords (D-Arizona) is, as most news outlets have called it, a tragedy. At least six people were killed, while another 13 were injured. Rep. Giffords was shot, apparently point blank, in the head, through and through. The motive is of yet unclear, but a lot of snap judgments have been made. 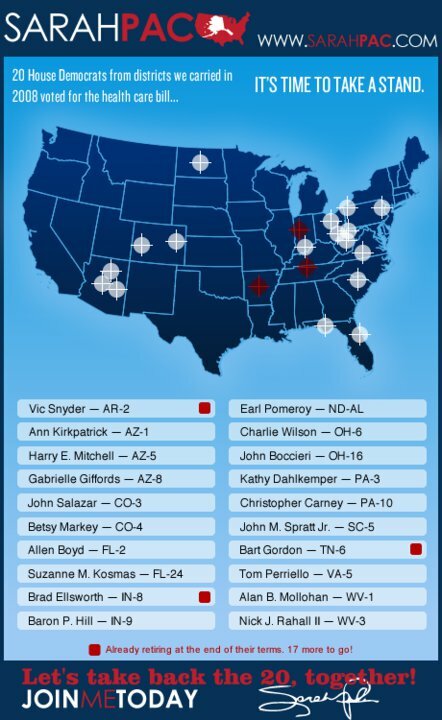 I was one who made some of these snap judgments, retweeting some tweets that make a connection between the shooting of Giffords and the targets/cross hairs that Sarah Palin put on certain members of Congress (Giffords was one of the 20) on her website Take Back the 20 (website has been down all day). While I did clearly state on my twitter account that I do not think there is a direct connection between Palin's use of this type of imagery and the shooting of Giffords, I do think that there is a direct correlation between violent rhetoric and real-life violence. I really am not trying to point fingers at any person or political group. I simply think that we have allowed violent rhetoric to flood our speech and have done so with the naive idea that there would be no consequences. We have created and allowed to flourish a political system where violence is touted as the solution. I believe this is connected to the idea that the only real way to win international battles is to go to war. Both perspectives are skewed and immature. To be sure, America was birthed by violence, but we don't have to allow that to determine our present and our future. We as a nation are better than resorting to violence, but it has to start with us. We cannot just blame politicians for using violent rhetoric when we do the same, just not on a national scale. We must remember that just because we disagree with someone's religious, political, etc. beliefs that does not mean that person should die, or even be injured. As long as we keep telling our white children that they cannot date black people and as long as we keep speaking condescendingly about "them" and the "others," whatever the group may be, we are a part of the problem. Sociologically, when a group/person feels as if they are threatened, they tend to strengthen their boundaries and often do so through violence. The simple fact of where we live means that our religious and political boundaries will be threatened on almost a daily basis. We typically highlight these boundaries by increasing our negative rhetoric of the "other side" and the positive rhetoric of "our side." In politics this often results in our party being right and listening to the American people and the other party being wrong and pushing through their agenda. In religion, it means that God is on our side. But, we are not as different as we think. We all have hopes and dreams. We all love and want to be loved. We all have hobbies and families. We are all part of the human race. We all are just trying to figure out hoow to get through this crazy thing called life. We are in this together. It's time we start acting like it. We need to take a long, hard look in the mirror and evaluate how we are justifying violence, inciting violence in subconscious ways, and creating divides. The problem is with all of of us, so the solution has to come from all of us.